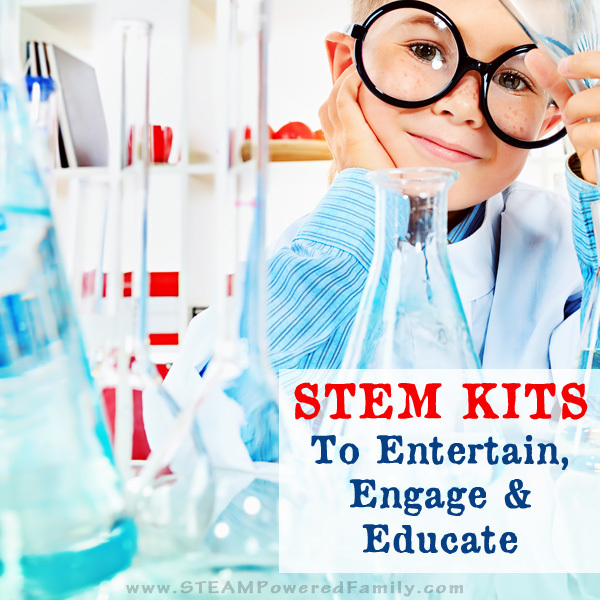 Tips for adapting STEM activities and STEAM activities for varying ages, abilities, interests and group sizes. Science, Technology, Engineering, Arts, Math. If you are an educator you’ve likely already faced that moment of dread. 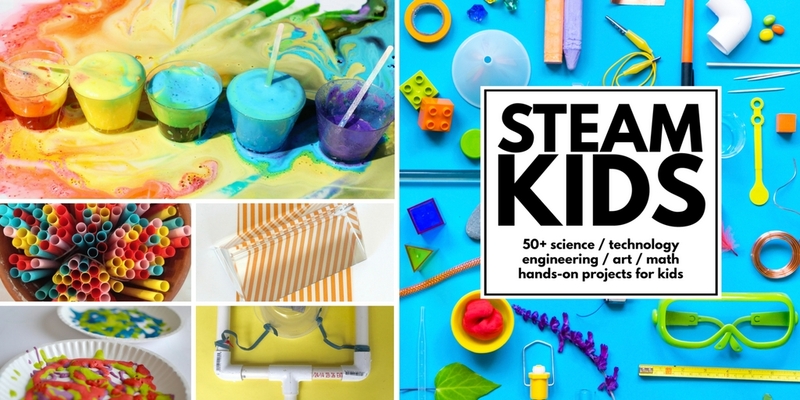 You’ve found a fantastic STE(A)M activity but you have a large group of kids, varying ages, different levels of abilities, and undoubtedly a vast variation in level of interest. Teaching STEM and STEAM to a group can be a challenge, but it can be done. Herding chickens. That’s what it feels like to me when I’m trying to teach STEM and STEAM work to a group. It’s like trying to convince a flock of chickens to all go in the same direction, in a somewhat orderly fashion, and arrive at the same destination. However, just like herding chickens, it can be an exercise in futility and stress… if you approach it the wrong way or with the wrong goals in mind. Here’s the thing with STEM and especially STEAM activities, they are meant to foster creativity and individual development. Our goal with STEAM work is not to create a line of placid sheep, we want our creative chickens. STEAM ~ Science, Technology, Engineering, Arts and Math ~ is a wonderful approach to education that builds in creativity and problem solving into projects. 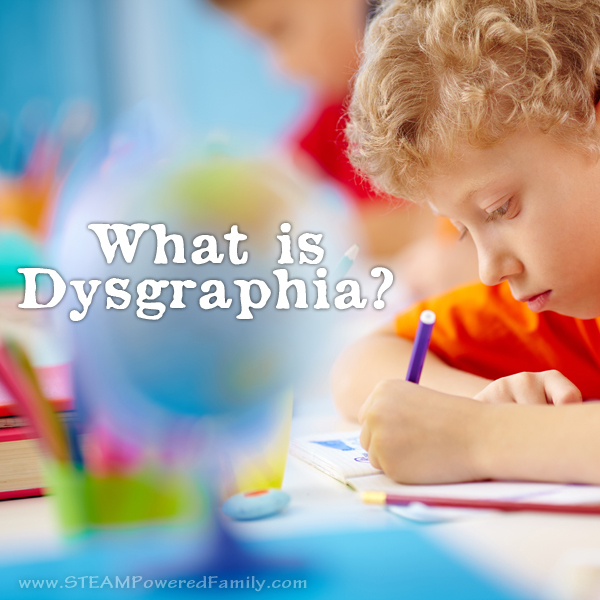 It encourages critical thinking, inquiry based learning, and forging new paths through learning. It’s hands-on and often has ambiguous goals. The main goal simply being to embrace the process of learning and discovery. In my opinion, if you are doing STEAM projects and everyone’s project looks exactly the same when you are done, then you’re doing it wrong. From our earliest days, we are taught to fit in the mold, to create projects that look exactly like the creations of everyone else in our class. STEAM goes against this trend and encourages students to become individuals and utilize their strengths. To work in teams and use the strengths of each individual to further the goals of the team. Collaboration is celebrated in STEAM, because together we can do really great things. Now, that brings us back to the whole herding chickens problem. How can we teach STEAM to a group of kids that have such diverse needs without ending up face first in a pile of chicken feed… or worse? 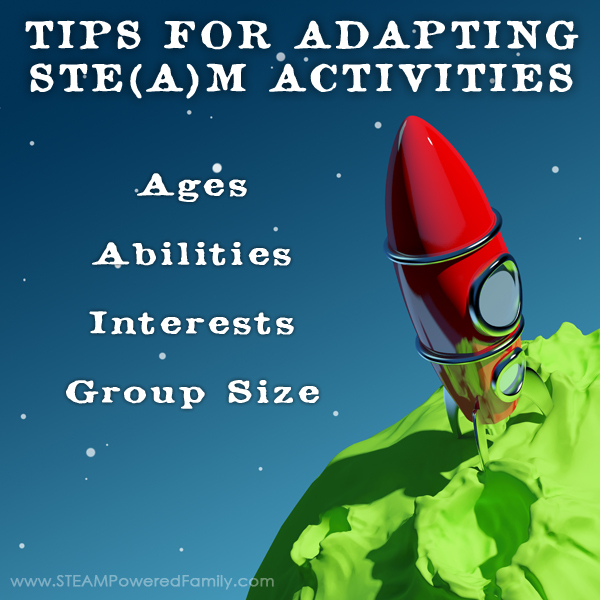 Here are a few tips for teaching STEAM to diverse ages, abilities, interests and group sizes. Chose well researched and proven activities. I can’t stress this one enough. When you are working with a group you need projects that have predictable outcomes. This way you know where certain children may struggle. For instance, if you were to do the Circuit Bug Activity, you will want to pre-cut and strip the wires for younger children or those that struggle with fine motor skills. With well researched activities, you have a detailed blueprint for how to do the activity, which will allow you to see which steps may result in struggles ahead of time. This allows you to prepare appropriately. Preparation is key. To be successful in teaching STEAM, and adapting it, you need to have a strong understanding of the project. Do the project yourself ahead of time. You may discover that in your window of time, or with the resources you have, it would be easiest to prepare certain pieces ahead of time. Or perhaps parts can be done as a demonstration. With my Lollipop Layers activity, you could do the preparation of the lollipop liquid in front of the group. Use the power of groups. Have the children break into groups. If you know the strengths and weaknesses of the students, try to partner them up so students can work with their strengths and have help with areas they struggle. Even if some students can’t do certain steps, they will learn by watching their peers. And learning the power of collaboration is a fantastic life skill. Consider your tools and equipment. Sometimes an activity can be made easier, or harder, simply by changing which tools are being used. Or perhaps, with older students, don’t tell them what tools they need. Simply provide a variety of tools. From there allow them to use the tools as they see fit to complete the project. Through trial and error they will discover which tools do the job the best. Going back to the Circuit Bugs example, you can use a variety of tools to cut and strip the wires. Provide project extensions or opportunities for further exploration. When someone becomes captivated by an idea or concept encourage them to continue learning, discovering and creating. While that passion is strong, continue feeding them what they need to keep the excitement going. This is how true innovation and creativity happens. 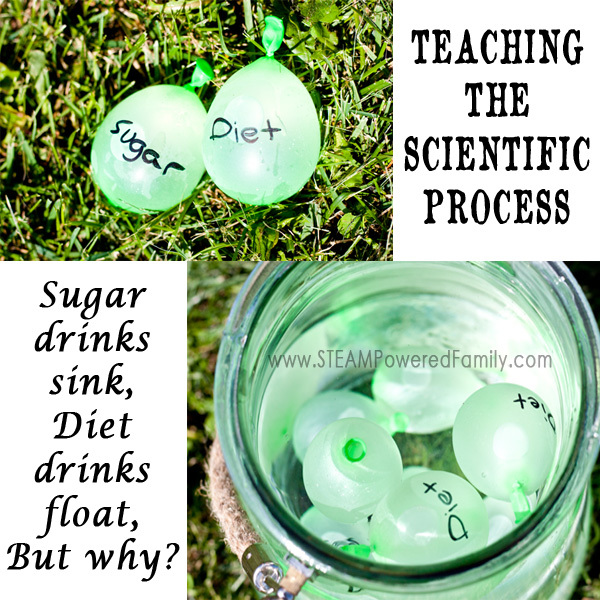 This can be done by letting them create new projects (like I did with our Inquiry Based Water Balloon experiment), encouraging tinkering, or providing further resources or project ideas. Focus on the true goal – learning. Your projects may not turn out perfectly. You are going to have failures. There are going to be struggles. In the end the goal with STEM and STEAM learning is to develop skills. These skills include critical thinking, inquiry, creativity and collaboration. Even if you don’t end up the perfect product, as long as you have fostered the right learning, your STEAM activity is a success! Remember, you can always come back at an activity at another time and try again. All of our great innovators in history know the power of trying again and learning from failure. I’m so excited to share this resource with you. It’s an amazing collaboration between some extremely talented STEM and STEAM educators, including an MIT Engineer who coordinated all of us chickens. This book is beautiful, inspiring and informative. The perfect addition to your STEAM learning! Learn more about STEAM Kids here.